Since Nintendo first gave us the Mii's and Wii Sports, many ideas have circulated about expanding them. Then came Wii Sports Resort, which expanded the sports on offer and introduced us to Wuhu Island. The ideas since then cataclimised. Whether focused on one part of the island or the whole of it, there has always been an idea. Then we had Pilotwings Resort on the 3DS, which used Wuhu Island as its setting. The Wii Fit games use Wuhu as a basis for the jogging stages. Other games have kept the island alive, with two tracks in Mario Kart 7 and two stages in Super Smash Bros 4 WiiU. Of course, no full game set on the island has been announced yet, but maybe there's a reason for that. Now then, ignore the blatantly ripped assets from other games and just focus on the cover as a singular game. This is one of the most thought of ideas, with varying forms. The idea is to put all of what came before into one game. In other words, all the sports seen in the two Sports games, jogging as in the Wii Fit games, and racing and flying from Mario Kart and Pilotwings respectively. Going one further, adding an open exploration of walking around the island. I will now run a more in depth look at this idea, as I find the idea an intertesting one that could offer a lot of content under one roof, and with latest developments in the Nintendo landscape, it gets even more better. First off the general idea. You'd have the choice of being located at one of the two hotels or on the Queen Peach ship. It doesn't make much difference where you choose, but this would be your base of operations. Clothes, upgrades, leaderboards, and a host of other things would be located in this room. The island itself would be littered with sporting entry points. These are where you would enter the sport from. So a point near the bowling alley would allow you access to the bowling alley. Exceptions being those you wouldn't be able to reach, or those with no defined location, such as skydiving or archery. For those sports, the main island hotel serves as a reception area, with all other sports being available on the list for when you quickly want to get into a game. The sports themselves would also be more fleshed out and have a lot more to do. I've seen people wonder many times why flying in Pilotwings Resort's Free Flight Mode was restricted to five minutes, so I feel unrestricted flying would be preferable. Same with a kart. The ability to drive around anywhere you can reach, as well as the various challenges. For flying a plane, dogfighting. For karting, Grand Prix's and Time Trials. Except the tracks would not be the same ones from Mario Kart. No under water driving or gliding for the karts, since there are specific water and air sports already available. One extra feature, and a lot of use I am thinking for them, would be amiibo. Instead of being character specific, they would be series specific. Once a day, you could scan in an amiibo from a series and collect items from that series. So any from the Mario series could get you a baseball bat coloured with Mario's dungarees, for example. Or an amiibo from the Sonic series could get you an Omochao skin for your plane. After you collect a certain amount of items from a series, more amiibo functionality would be unlocked. This is when the features swap from series specific to character specific. Scan a specific amiibo in on a newly unlocked amiibo selection screen and you would be able to play as that character, complete with their own stats within the various sports. So now there is the choice of continuing to play as your Mii, or use one of your amiibo. Use of the amiibo would allow for something else, though. After a certain period of using an amiibo from a specific series, the world and events would start to represent that series. So use of a Legend of Zelda series amiibo would make the trees look like those from the woods of the Kokiri Forest and the sword fighting arena that of one of the Streetpass Arenas from A Link Between Worlds. Use of a certain character over time would start giving the world an even more specific look. So buildings of the Pokemon world would start to have Pikachu billboards advertising the latest in Pikachu news, as an example. The fact is though, if you don't want the changes to happen, they can be disabled. And so we come to the near end of this general idea. I'm sure this is something like what many people ask for when they want Wuhu Island to be used more. 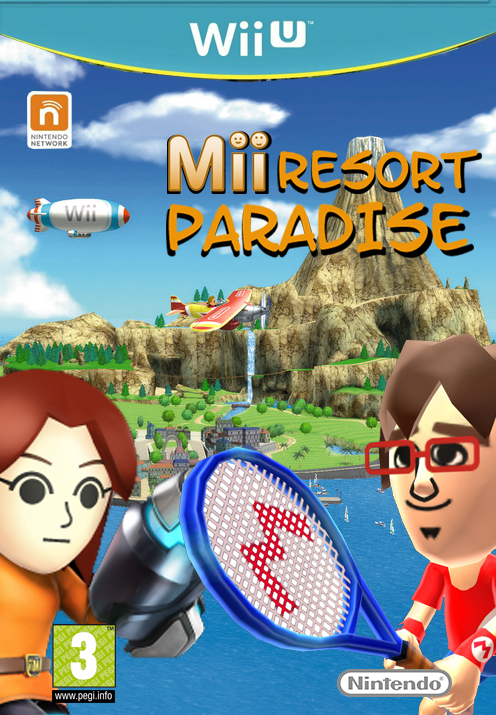 Many fans of Resort wanted the next expansion of the series to be something more like this, and not just a reversion of the original. The Island itself has a lot of potential, as other ideas show. A Google search of "Ideas for Wuhu Island" brings some of them within the first few pages. A game like The Sims, for example, or a murder mystery game set within one of its hotels. Ideas for the island are plentyful, but one of the key ideas each of them has is that more of the Island has to be explored.